Many Peruvians are descendants of the Incas who were the native people of Peru. However, many people also have descendants who came from many European countries. In the 1500s, the Spanish conquistadors came to Peru and fought the native peoples. Over the centuries, many Spanish intermarried with the native peoples. Mestizos are people of mixed blood and have parents who are of native and Spanish heritage. Missionaries (Catholic priests who belonged to the Jesuit order), traveled with the conquistadors and converted many of the people to Catholicism. Many of the people in Peru live in small cities, towns and villages. Living in a country with many hills -- as well as the Andes Mountains -- makes travel difficult. 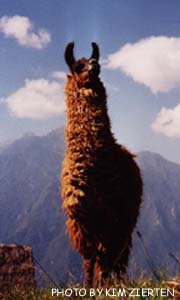 Pack animals, such as llamas, are used to carry heavy loads over the mountains. Some cities are not accessible by road and can only be reached by airplane or boat. This makes transporting food difficult; so most people living in rural areas eat foods that can be grown nearby. Farmers grow food anywhere there is land -- even on the sides of mountains. For centuries the Peruvians have laboriously moved rocks and land to build terraces on the sides of mountains. Many of the mountains on which food is grown are so steep that farm machines cannot be driven on them. In these places, farm work must be entirely done by hand. It is hard work to climb the hills and even harder work to harvest the food and carry it to where it will be sold or eaten. The major food crop in Peru is potatoes. Many people eat them in some form at every meal. Most people in North American and Europe are use to seeing only four or five types of potatoes at the market. Peruvians grow over 200 types of potatoes -- even blue ones! The potato is indigenous to South America and it was the Spanish who introduced it to Europeans. Maize, or corn, is also a very popular food. Corn is dried on the husk then stored until it is needed. The dried kernels can be removed and crushed into meal which can be made into porridge. The Incas mixed water with the corn, fermented it, and poured off the liquid as a type of beer. Hundreds of years later maize beer, or chicha, is still a popular drink. Mate de coca is a traditional tea brewed with coca leaf leaves. (The leaves are about the size of leaves found on a rose bush.) It is just as common to be served at cup of hot water with a bunch of big leaves floating in the top as it is to be served a tea bag. Peruvians drink it to soothe upset stomachs. The tea is even supposed to help travelers get over altitude sickness. Homes are constructed in most countries by using the most plentiful natural resource. In Peru, this is the soil itself. 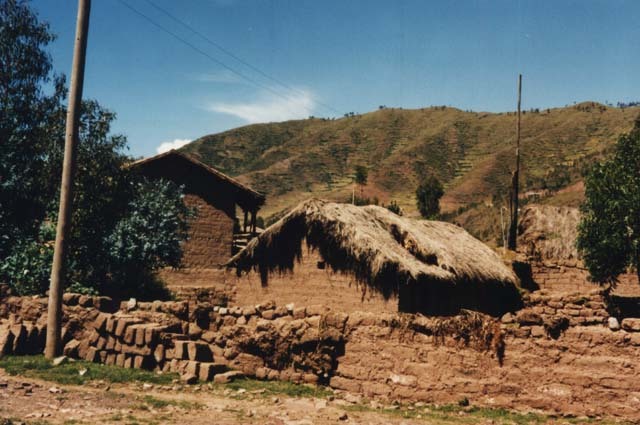 Dirt is plentiful, so adobe bricks are used for many of the houses in the countryside. On the other hand, cities usually have buildings made of stone or brick. Few of these buildings, however, are able to rival the stone craftsmanship of the ancient Incas. 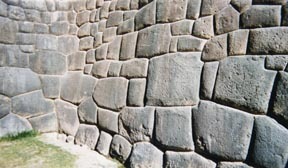 The ingenuity of the Incas in constructing great buildings of stone can be seen in Cuzco, the surrounding towns, and at ruins such as Machu Picchu. Many of the temples and public buildings were constructed by carefully carving and fitting together boulders and other large stones. It is still somewhat of a mystery how people who lived 500 years ago could carve large rocks so that they could fit together so perfectly. The rocks are so lightly pieced together, that in most places it is impossible to fit a knife blade between them. In the hill city of Ollantaytambo the nearest stone quarry is miles away in a river valley. Archeologists hypothesize that rocks weighting hundreds of tons (thousands of kilos) were hauled up to the mountaintop. Because the work is so exhausting, is it theorized that slaves did the grueling work -- just as slaves moved the greater stones in Egypt in building the great pyramids. In recent years the government has made an effort to bring electricity to all homes in the countryside. Not long ago, electricity was considered a luxury that only people in the city or the well off enjoyed. Now, most people can have lights, listen to the radio, or watch television.